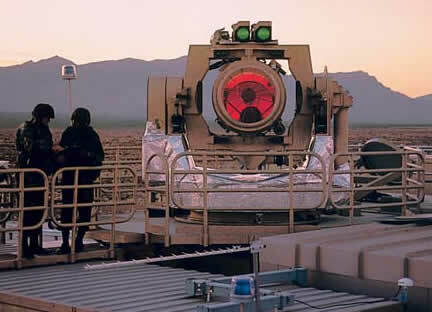 The Mobile Tactical High Energy Laser (MTHEL) is a chemical laser-based energy beam weapon currently under development by the U.S. Army and Israel. Last month, the system successfully tracked and destroyed a large-caliber test rocket at the White Sands Missile Range in New Mexico. The system has also been used successfully on smaller, lower-flying Katyusha rockets (the type used by Hezbollah guerillas along Israel's northern border). A fire control radar positioned near the hostile zone scans for threats. Once detected, the target's trajectory is tracked and a pointer-tracker is locked onto the target. Once locked in, a high-energy deuterium-fluoride laser beam is trained upon the target. The beam is only a few inches in diameter, but can heat the rocket's steel shell until the missile or shell warhead explodes. The system uses replaceable chemical charges to provide the power; it costs approximately $3,000 to fire (making it much cheaper than other anti-missile systems). The earliest research into military lasers began in the 1960's. As early as 1978, a chemical laser blasted through a tethered helicopter. In science fiction, energy beam weapons have been in use since War of the Worlds, published by H.G. Wells in 1898; see the article for the heat ray. For more information, see Tactical High Energy Laser and Polular Mechanics.